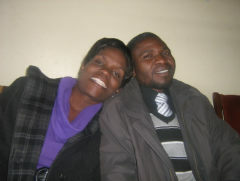 Gideon and Jennifer have developed many networks and key relationships which has enabled them to have a significant impact in various remote villages in Zimbabwe. Chirogwe is not far from Mandiva and is very remote. There is a church of about 80 people. The pastor is very committed to helping the people spiritually and physically and has invited Fountain of Hope to come and help them emerge from poverty. There is already a borehole in the village and Fountain of Hope is keen to maximise this by doing Foundations for Farming training in addition to setting up a chicken project. There is also the potential to restore a dam at some stage in the future. This is a very arid area renowned for huge rocky outcrops and sheets of rock below the topsoil. It is a hostile environment for farming and water and people do not have the skills or resources to farm successfully. Subsequently the people are very poor. In 2001 Rob Purdue, BHW Executive Chairman, travelled to visit Gideon and Jennifer in Mthombothemba as his nephew was living there. Rob was impressed by them and BHW's Field Director continued to dialogue with them. In December 2012 funds were sent to assist with training some of their people in Foundations for Farming and then late in 2013 BHW commenced partnering with Gideon and Jennifer at a greater level, providing financial support for the Peniel children's home (ZIM02), Mthombothemba community development (ZIM02a), and personal support for Gideon and Jennifer (ZIM02b). Following on from this, in 2015 a community development project in Makamure was commenced (ZIM02c), in 2016 a community development project in Mandiva village commenced (ZIM02d) and then in 2017 two more villages were added - Chirogwe and Mtshazo (ZIM02g). There are many beneficiaries here as the whole community benefits from gardens being grown, people having enough food to eat, and families becoming self-sustaining. This type of community development lifts the morale of everyone in the community. Gideon and Jennifer/Fountain of Hope understand that transformation requires a broad based holistic approach to solving the issues and the starting point has been building relationships with the community. We continue to be incredibly encouraged by the commitment of Gideon and Jennifer to the communities they are involved in. Their love for these people and their desire to transform these communities is inspiring. Gideon was raised up in a very remote and poor community. His father died while he was still very young which eventually meant he had to stop going to school while doing Form 2. He hated God then for making his family poor, taking his father away when he was still young, and allowing the school authorities to chase him away from school when he really wanted to proceed with education. However, his friends from school helped him to study from home by bringing their books to him and eventually, although he did not go to school formally like other children, he was able to write his ‘O’ Level exams and pass all the six subjects. He then later joined YWAM where he met Jennifer whom he later married and adopted her five children. They live in a rented house outside Bulawayo. The vision of Fountain of Hope is to communicate the love of Christ to orphans, vulnerable children, downtrodden communities, widows and families affected by HIV/AIDS and poverty by meeting their physical, emotional, social and material needs. They do all that they do to point the poor to Christ, the true Fountain of Hope which never dries up. • Establishing a free-range chicken project to generate income. They have already established a successful chicken project in Mandiva and will look to imitate that. Fountain of Hope has developed effective programmes in a number of villages in this area of Zimbabwe but are not willing to just do the same thing in every village. They start small and assess the capacity and needs of the villages before starting the next initiative.